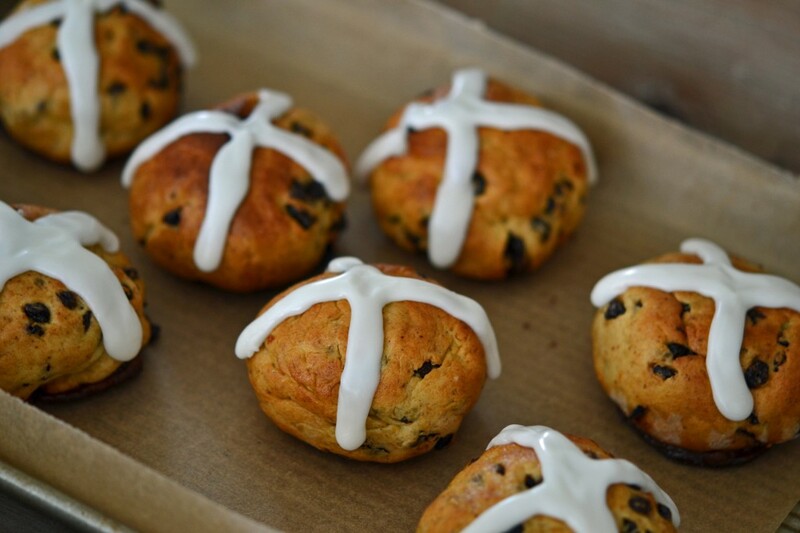 Before going gluten-free, I bet you celebrated this time of year with Hot Cross Buns. 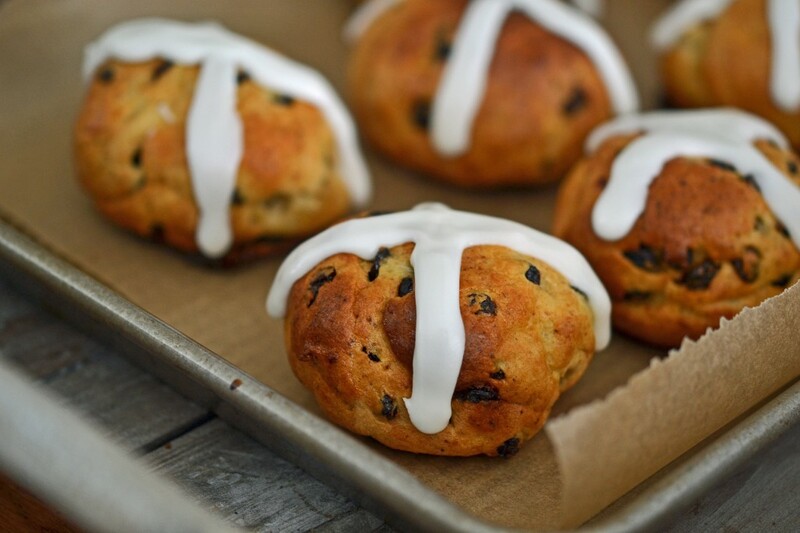 This year, you should have gluten-free Hot Cross Buns. 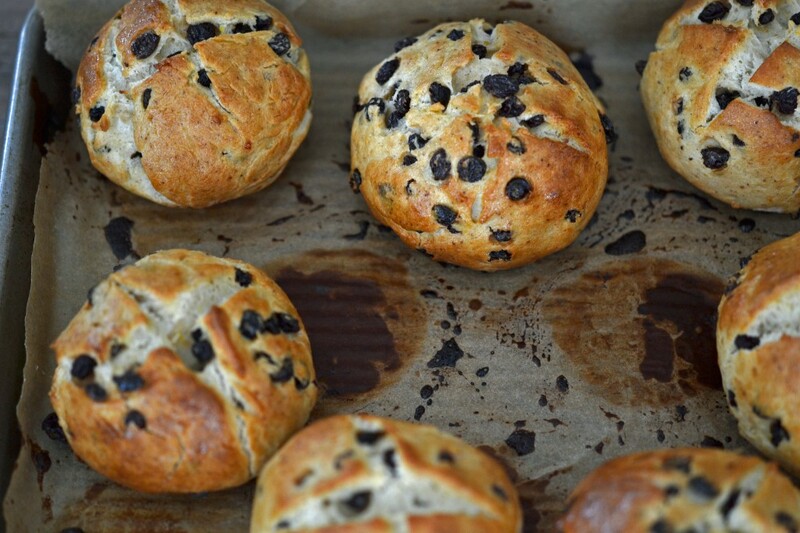 Warm, sweet and fragrant, your gluten-free hot cross buns should taste just as good as you remember. If they don’t, something’s not right. “Good for gluten-free” isn’t.good.enough. So today’s post is all about Normal. I’m big on Normal. I’m here to help you walk toward Normal. And to me that means What You Knew Before. Before going gluten-free. Yeasty and lightly sweet, with just the right spices (don’t skip the cardamom or they just won’t smell right), you’ll make yourself proud. They’re like a less-eggy, differently spiced version of my Gluten-free Christmas Panettone. Divide the dough into 11 pieces, each about 95 grams, and roll them into tightly packed buns (I wish my own buns were tightly packed) with well-floured hands. Start with slightly wet dough, and then dust with flour. And brush them with an egg-and-sugar glaze. Look at that. Just waiting to be crossed with icing. Here’s the printable recipe. Read it all the way through before getting started, weigh your ingredients, and you’ll be all set for Easter – just like normal. 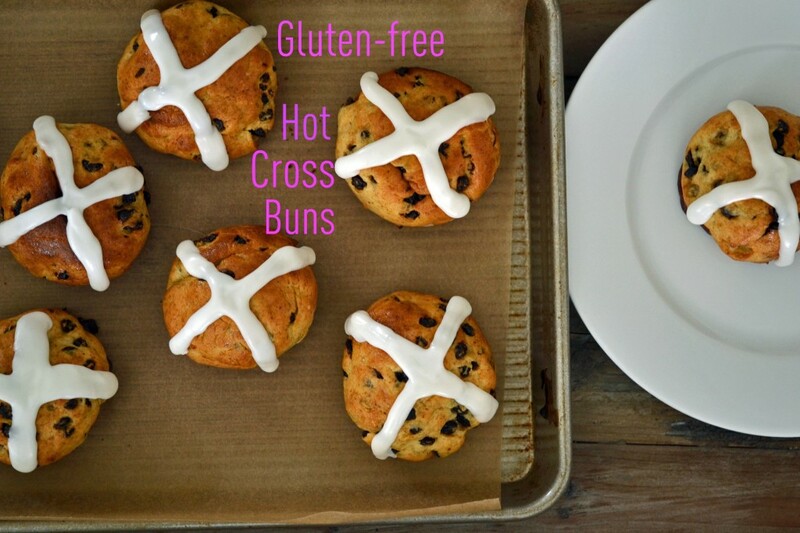 Gluten-free hot cross buns – for Easter! In the bowl of a stand mixer, place the flour, xanthan gum, granulated sugar, yeast, cream of tartar, cardamom, cinnamon and allspice, and whisk to combine well. Add salt, lemon zest and orange zest, and whisk once again to combine well. In a separate small bowl, place the dried currants, toss them with a tablespoon of the dry ingredients and set the bowl aside. Add the vanilla, vinegar, milk, 1 egg and the egg yolk and the butter, and mix on low speed to combine. Turn the mixer up to high speed, and allow to mix for about 6 minutes uninterrupted. 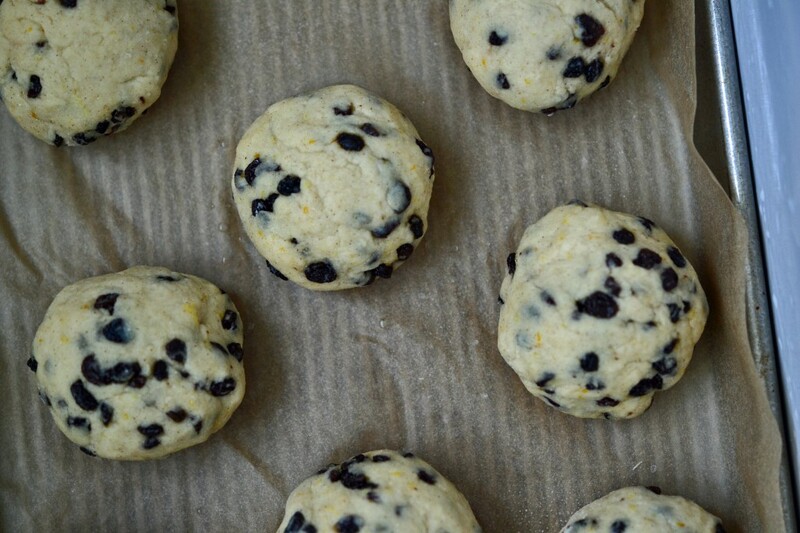 Turn off the mixer, and add the dried fruit and reserved dry ingredients to the dough, and mix until the currants are evenly distributed throughout the dough. 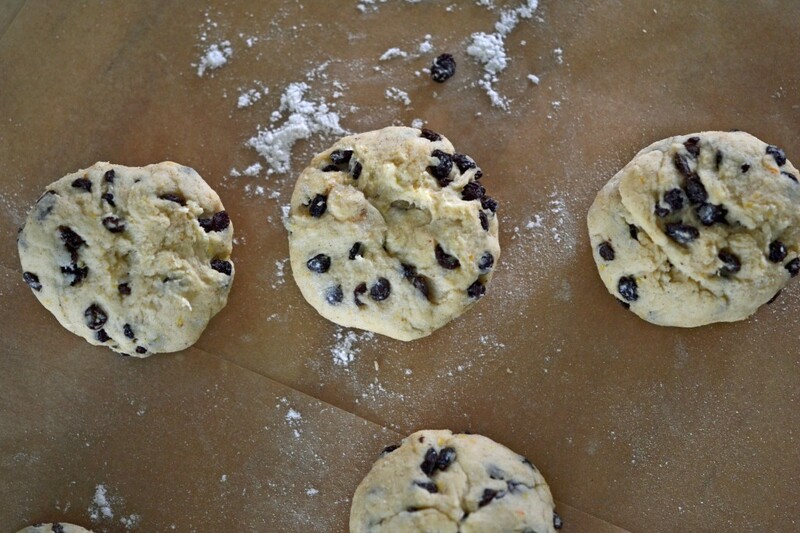 Turn the dough out onto a lightly floured piece of parchment paper, and sprinkle lightly with more flour. With well floured hands and a bench scraper, divide the dough into 11 pieces, each weighing about 95 grams. 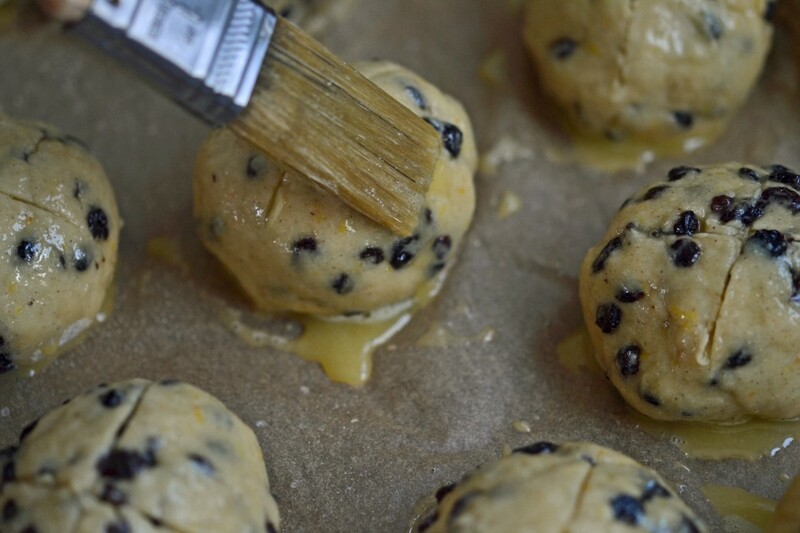 With well-floured hands, roll each piece of dough into a tight ball. Place the buns about 2 inches apart on parchment-lined baking sheets. While the buns are rising, preheat the oven to 375 degrees F and make the egg glaze. In a small bowl, place the remaining egg and beat it well. Add the 4 tablespoons confectioner’s sugar, and beat to combine well. Once the dough has finished rising, brush the top of each bun generously with the egg glaze. With a sharp knife, slice a shallow cross (+) in the top of each roll (see photo). 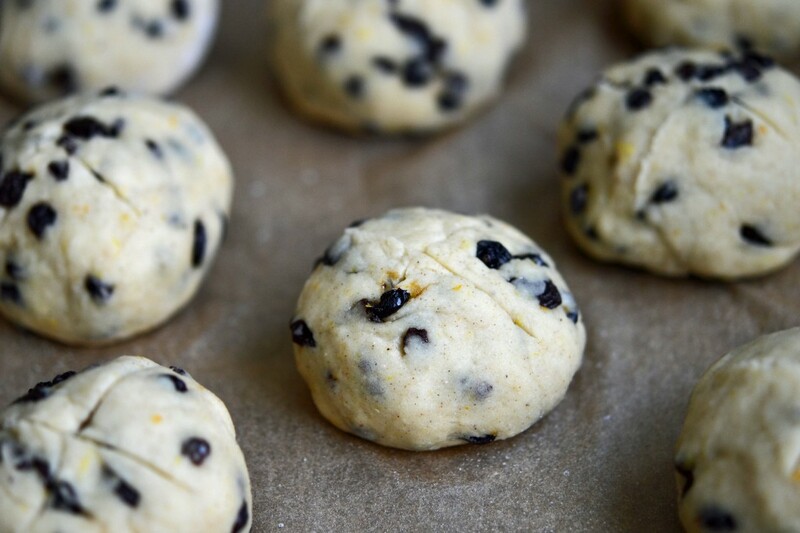 Place the baking sheet it in the center of the preheated oven and bake, rotating once during baking, until the buns are golden brown and firm to the touch, 25 to 35 minutes. Allow the buns to cool for about 10 minutes on the baking sheet before transferring them to a wire rack to cool completely. 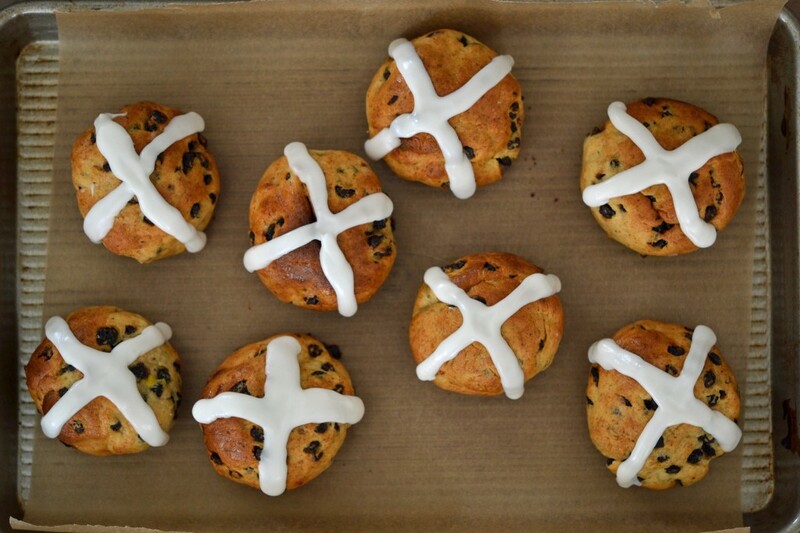 While the buns are cooling, make the icing for the cross. In a medium-sized bowl, combine the remaining 1 cup confectioner’s sugar with 2 tablespoons milk. Mix to combine well. It will form a thick paste. If it is so thick that you will not be able to squeeze it through a plain pastry tip, thin it with some more milk, a drop or two at a time. It should be just thin enough to pipe, but still very thick. Once the rolls have cooled completely, place the icing in a pastry bag fitted with a #10 plain tip, and pipe a cross (+) neatly over the cross you made with a knife, on each roll. If you attempt to ice the cross before the rolls are completely cool, the icing will melt and run. P.S. If you haven’t yet, please pick up a copy of Gluten-Free on a Shoestring Quick & Easy! I can’t keep the blog going without your support, so buy one today! I made these this morning – Yum! My dough was very soft so instead of trying to shape by hand I just used a large cookie scoop to place them on the cookie sheet and then used floured hands to shape them a bit. I also added some lemon extract to the icing. The texture on these is great- very wheat like. Thank you for sharing! Yum! How long do you think these will keep? I’d like to make a test batch for tomorrow, and if they’re good, keep them and serve them for lunch. Thoughts? oops, I actually could care less if you read “container garden.” apparently it auto-links to your blog if you have one… sorry! Because of the glaze, they keep relatively well. Whatever you do, though, don’t put them in the refrigerator. Never store bread in the refrigerator. It’s too drying. If you’re at all concerned, freeze them in a single layer on a rimmed baking sheet and defrost before serving. You can even spruce them up in a warm (not hot) oven (about 325 degrees F) for a few minutes before serving. If you have no daughters, give them to your sons. Have a wonderful Easter/Passover. Thanks for all you do. Go, eat chocolate! Wow! I am so very impressed, especially that they don’t contain yeast! This is a recipe I will surely be trying this weekend! Happy Friday! My son and I made these today and they are AWESOME!!!! The cherry infused cranberries worked really well with this recipe. Thank you, thank you, thank you. My son, of course, says we now have to make sure we dry some of our currants this year ;) . thank you these taste amazing! Can’t find dried currants ANYWHERE…..so I picked up some cherry infused cranberries. I have a currant bush but didn’t think to dry any last year….lol. I made them all into syrup. Nicole, how adorable. I’ve never eaten nor seen a “hot crossed bun”, only heard the term in childhood. Was this common Easter fare in the past? Anyway, what else (if anything) is commonly substituted for currants or are they ONLY made with this fruit? These look delicious! Im recently gluten-free, and appreciate your recipes! Thanks! I haven’t tried it, Melita Invitations, but I would suggest using 2 1/2 teaspoons guar gum in place of 1 3/4 teaspoons xanthan gum.